I am a huge fan of beef and bbq. Tim and I have been eating Mexican food mainly when we eat out, because I’m not sure how great the Mexican food will be in MN, so far away from the Mexico border. But I had to have some really good Texas bbq before leaving Texas too. 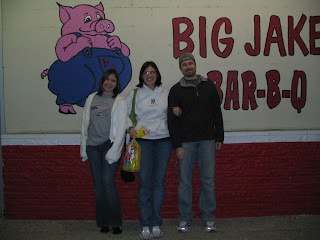 Tim, Katelin and I all went out to eat at Big Jake’s last night. It’s a great place to eat, and it was nice to go there again since that was who catered for our rehearsal dinner. We ordered a family dinner of ribs which came with a whole loaf of bread, and we got some corn on the cob and some delicious potato salad. Is it sad that Mexican food and BBQ are on the top of things that I will miss from Texas? I am stocked up on TexJoy, so I at least have my seasonings for cooking up in MN. Glad you’all had a nice time, we miss ya!! I haven’t heard of milk-in-a-bag. I’ll keep my eyes and ears open for that. I’m real picky when it comes to milk, so I don’t know if I’ll try it. I’m hoping we’ll come across a great Mexican restaurant…we’ll see.